No bigger than a book, the BK-7m is a dream machine for the entertaining artist or solo musician who needs a backing band onstage, in the studio, or at home. 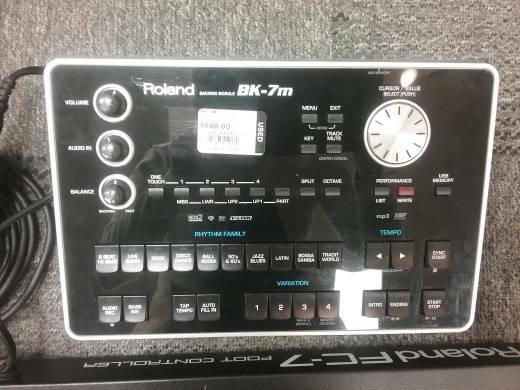 With hundreds of great tones, music styles and rhythms on-board - all quickly accessible with one-touch buttons - the BK-7m will make you sound like a pro ensemble onstage. Choose from the library of built-in styles or play your own music files directly from USB for play-along accompaniment. You can even record your performances directly to USB memory for distribution and archiving. - Portable backing module compatible with MIDI-capable pianos, keyboards, accordions, organs. - 1,000-plus tones, 57 drum kits, 128-voice polyphony. - Over 900 Music Assistants covering every musical genre. SMF and audio file playback via onboard USB connector. - Audio recording in WAV format directly to connected USB storage device. - Cover function for SMF's and Music Styles. - Composite Video Out to display Lyrics and/or Chord Symbols on external display. 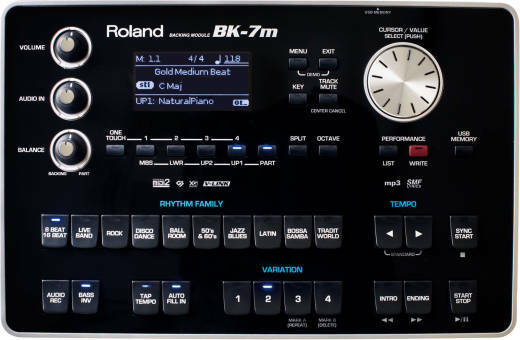 The BK-7m is powered by a state-of-the-art, Roland sound engine, packed with over 1,000 great tones and dozens of drum and percussion kits. The module is able to handle 128 voices simultaneously and is compatible with a variety of voicing formats, including GM2, GS and XG Lite. Feed the BK-7m a quality, Standard MIDI File, buckle up and get ready for a great-sounding band. You can also use it as a high-quality sound module for a MIDI-compatible instrument such as a digital piano, V-Accordion, organ or guitar. In addition to playing MIDI Files with its internal sound generator, the BK-7m can also play and manipulate audio files. Play MP3 or WAV files via USB and use the onboard controls to change key signature and tempo to best suit your vocal range or performance style. You can also use the BK-7m's Center Cancel feature to minimize the vocals from pre-existing songs to create instant, karaoke-style sing-along tracks. To expand the capabilities of the BK-7m, a USB port is provided for connecting to industry-standard USB storage devices such as a USB key or self-powered USB hard disk for playing and modifying/saving files. You can also use the USB port to record your performances as audio files (WAV, 44.1KHz/16-bit linear format) on a USB storage device. The BK-7m's composite video output can be connected to an external monitor, which allows the audience or other musicians onstage to follow the lyrics and chord symbols of the performed song. Turn your show into a multimedia experience! Weight: 1.7 kg 3 lbs. 12 oz. I think the BK-7M has been underrated. I’ve been using one with a Roland FR-7X V-Accordion for about 3 years now. It’s an absolutely amazing band-in-a-box. I sound like a 4 piece band. I only use the sounds from the BK-7M. So the accordion is only acting as a MIDI controller. The left hand chord buttons in the accordion 120 bass section trigger the arranger much like your left hand does on an arranger keyboard. The right hand triggers the built in instrument sounds like Organ, Sax, etc. The bellows on the FR-7X control the internal volume levels of the digital sounds just like a real accordion and the BK-7M recognized the volume control messages from the accordion. So I can control the volume levels in the BK from the accordion. No volume pedal needed. 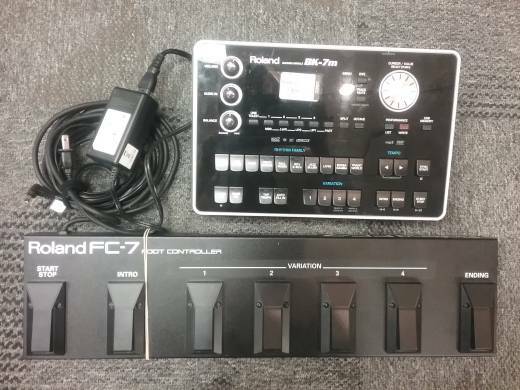 The BK-7M has a very easy MIDI connection setup for most types of instruments and in the case of my Roland FR-7X accordion, it auto-detects it without any messing around. No fuss, no muss. This is a great backing module and would recommend it to any one that does a one-man-band shtick. Unfortunately it seems that it might just be or soon to be discontinued by Roland. I certainly hope not though. I hope Roland is working on an updated version, soon to be released. This is, was, a great unit. If you're thinking about getting one, I snap one up right away while they're still available!